What we know think of as Birmingham, had three poor law unions overseeing the care of the poverty-stricken in the area. What is now the north of Birmingham had Aston Union which built cottage homes at Erdington, to the east of Birmingham was Birmingham Union with cottage homes at Marston Green and to the south was Kings Norton Union which built cottage homes at Shenley Fields near Weoley Castle. In 1912, three unions all became part of one large Birmingham Union. 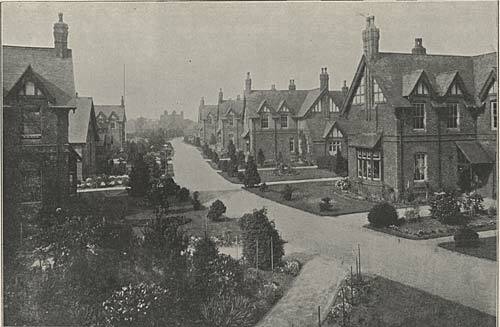 The cottage homes at Shenley Fields were opened in 1887 and have the distinction of having been used as children's homes for 100 years, finally closing in 1987. Shortly afterwards, all the buildings were demolished to be replaced by housing. Initially, there were four cottages with 20 children in each - the first 80 children were brought into the homes straight from the workhouse. However, more cottages were added leading to a grand total of 11 cottages and Bythorn which was used as a home briefly. Other buildings on the complex included an assembly hall, school buildings and a swimming pool. In 1949, the homes were given names whereas previously they had been known by numbers but the biggest change came in 1966 when each of the homes became an independent children's home and the complex became known as The Drive. Do you have any memories you would like to share of Shenley Fields Cottage Homes or the children's homes on the Drive? We'd love to hear from you. The photograph above comes from the Eleventh Annual Report of the Cottage Homes 1898. 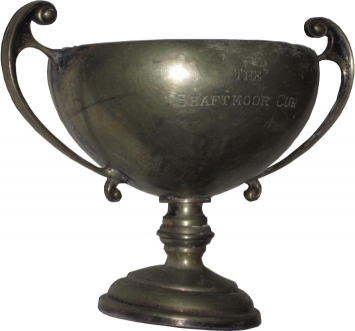 A few years ago I was shown this cup which has inscribed on it 'The Shaftmoor Cup'. It was apparently a cup that was given as a prize for inter-homes competitions in sport at Shenley Fields. Lucas', which used to sponsor children's homes at Shenley and encourage sports there, had works on Shaftmoor Lane. I wonder if they donated the cup and named it after their works? 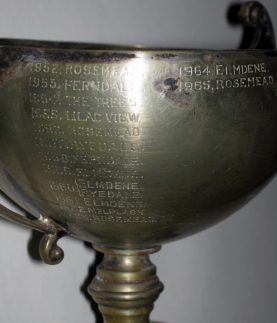 The names of the cottages that won the cup is engraved on the other side. It's a bent and battered old cup but carries a lot of history - all those years of children competing to hold it for the next 12 months. I would very much like to hear from anyone who remembers the cup and can tell us what competition it represented. For information about accessing your own case file or archive records relating to Shenley Fields Cottage Homes, please have a look at this leaflet. In 1945, the cottages of Shenley Fields Cottage Homes were given names instead of numbers. In 1966, they became separate children's homes - no longer part of a cottage homes set-up, they were distinct, individulally managed children's homes on The Drive. "I was in Shenley Fields homes in or about 1952/3 and if i remember it correctly the house I was in was called Greenways allthough my memory of people's names escapes me now. I only remember good times there. We had our own bed -.never heard of in my own home, good food, clothes, schools, a garden to play in. I remember spending a Christmas there - it was magical. If i think really hard I can imagine the place again. Sad that I can't remember the people's names. I wished at the time that I would never have to leave. I was then sent Erdington Cottage Homes, another place that I liked with everything you needed - space to play, donkeys to look after, again nice people. So say to all the people who gave their time to us in those days thank you so much."